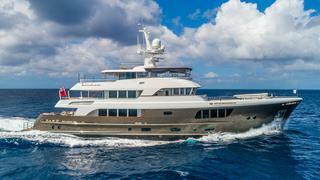 The 39.61 metre motor yacht Caryali has been listed for sale by Michael Mahan at Worth Avenue Yachts. Built in steel and aluminium by New Zealand yard Alloy Yachts to a design by Rene Van Der Velden, Caryaliwas delivered in 2013 and is both Lloyds classed and MCA compliant. A comfortable, spacious interior by RWD design accommodates 10 guests in five cabins laid out as a master suite with study, two doubles and two twins. All guest cabins have entertainment centres, Samsung television screens and en suite bathroom facilities while the crew quarters sleep four staff aboard this yacht for sale. The well-appointed main deck saloon boasts exquisite walnut wood panelling accented with stainless-steel inlays. Aft is a console table, two armless settees, two mohair sofas and a large mosaic custom cocktail table. There is also a credenza between the lounge area and dining room with a pop-up television screen. The light and airy sky lounge has large windows that open. To port is a set of white upholstered furniture including a large settee and four armchairs with two custom teak tables. To starboard lies a large bar with four white bar stools accented with teak backs. Up on the sundeck, forward is a 10-person Jacuzzi spa tub with sun pads on both sides while aft is a horseshoe-shaped bar. Her top speed is 15 knots and her power comes from two 1,300hp Caterpillar C-32-ACERT diesel engines. On display at the Palm Beach yacht show, Caryali is asking $27,500,000.